Biltong Vs Jerky! So what's the real difference between them? Home / Blog / Jerky Vs. Biltong. What is the real difference? Jerky Vs. Biltong. What is the real difference? Jerky Vs. Biltong. Although Biltong would be the winner in the eyes of a South African, we thought it would be useful to set the record straight once and for all! Jerky and Biltong are different, but what is the difference? Biltong and Jerky are similar in that they are both dried meats, the taste and the production process is different. Biltong originates from South Africa (of course), whereas Jerky originates from North and South America. In terms of texture, there is a vast difference! Biltong is, in its basic form, a dried steak, which is then cut to eat. This means you can have it wet or ‘rare’, medium, or hard ‘well done’ biltong. On our biltong product page, there is a drop down menu for you to choose if you’d like it to be soft, medium or hard. However, as jerky is cut then dehydrated anywhere from 3-8 hours, it makes for an overall drier product. It’s also usually Jerky can be made from either whole meat or minced meat. 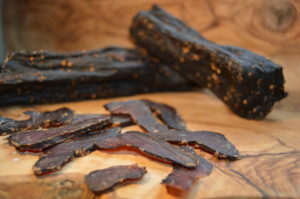 Biltong is traditionally marinated in vinegar and spices that add extra flavour to the meat. While jerky often has a dry and smoky taste. This is the key difference, Biltong is hung and air dried, while jerky is cooked on a rack. The word “jerky” has grown to include a wide variety of dehydrated foods. You can now find companies marketing mushroom jerky, cactus jerky, clam jerky, soy jerky, coconut jerky and bacon jerky. Biltong, however, remains limited to red meats, based on its ageing process and limited ingredients. The most popular being beef biltong, venison biltong and ostrich biltong. Head over to biltong page for and try it out for yourself! If you’re curious about all the different flavours and varieties of biltong, we also have a taster pack for you to try! So, what do you prefer, Jerky or Biltong? Get social and let us know on our social media!